Thank you, Chris Bostic, for being a part of this week’s BOD author spotlight interview. It’s a great opportunity for everyone to get to know you as a writer and fellow member. It sure is. It’s a huge pleasure to be here. I’ve been watching the group grow from the very beginning, and it’s amazing how large BOD has become. I’m thrilled to share a few words about me. Especially since I hate talking about myself without being prompted, so it really helps that you’re asking the questions. Can you tell us a little bit about yourself, where you come from, what influences your writing, and how and when you knew you wanted to be a writer? I was born in the suburbs of Chicago. While not completely set against the urban lifestyle, the lure of the country was much stronger. So after college in central and southern Illinois, I ended up in the suburbs of St. Louis, and I try to get away to rural Missouri as often as I can. I’m a civil engineer by trade. I live with my wife of nearly twenty years and our three children. The kids are all spread out—from a 16 year old boy to a 4 year old daughter. There’s one more daughter midway in between. It’s sort of the perfect plan for spacing out those future college payments. I suppose I found myself wanting to write somewhere around the third grade. I always enjoyed writing fiction, but my aptitude was math and science. And my dad was a math teacher. So a pair of engineering degrees came first, where I made it my goal to write my reports as little like a stuffy engineer as possible. Fugitives is my first published story of any kind, and I started working on it in early 2012—more than 30 years since the third grade. 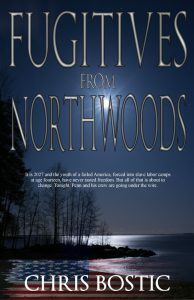 Tell us about the first book in the Northwoods series, Fugitives from Northwoods. The story is set in a not-too-distant future America. The economy has collapsed, cities have crumbled, and dictators have seized power to restore order. Think Great Depression-style New Deal gone wrong. In a corrupted take on the old Civilian Conservation Corps, teens fourteen and older are basically imprisoned in work camps to provide for the common good. Tired of their mistreatment, planning begins to break out and brave the wild. The newly 18-year-old male lead, Penn, runs a fishing crew in the lakes of northern Minnesota. He’s about to be assigned a new adult job and split up from the others once the prime fishing season comes to a close. Despite the huge risks, he has convinced his bunkmates, and the girls in the adjacent bunkhouse, to make a risky run for north of the border. The challenges compound as they are pursued by ruthless guards, tracking dogs, patrol boats and float planes. It’s a tight thriller story filled with loss and adversity. Whenever I read a book where the characters spend a vast majority of the story trying to survive in the wilderness, I wonder how much of the knowledgeable survival skills come from the author’s personal experience. Can you tell us what personal training you have in regards to wilderness survival and how this helped in writing Fugitives from Northwoods? The novel is set in the Boundary Waters Canoe Area Wilderness (BWCAW) of northeastern Minnesota. I’ve canoed there several times, most recently in 2012 with my son and others from his Boy Scout troop. 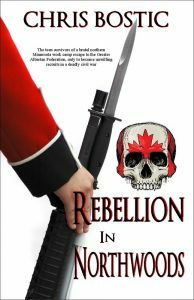 The book is at least 90% geographically accurate, with only a few liberties taken to up the ante a bit. Wilderness Survival definitely influences my writing the most. I suppose it’s the Boy Scout training, but a healthy love for the outdoors definitely factors in. There’s always some wilderness aspect in my books, and usually something that’s gone horribly wrong that makes it a survival novel. Thankfully, I’ve never had a truly awful hunting/camping trip, but it pays to Be Prepared. What is your preferred genre to read? Do you have a favorite series? It’s probably not a shocking revelation that I’m heavily into dystopian. The Hunger Games trilogy really started all that for me. I still need to get through Divergent and about a thousand other books on BOD before I claim a favorite, but I’m working my way through the list. What drew you to write in the dystopian genre, and why do you think this category appeals so well to young adult readers? I was hugely influenced by The Hunger Games. It’s really what drew me to writing. I used to read at lunch hour every day, now I mostly write. It all came about after reading THG. I read the full series once, then immediately restarted it. Made it all the way through a second time and started for a third. I couldn’t bring myself to read Mockingjay one more time. It’s my least favorite, so I took a break and decided that I ought to try to write something, which was right about the time I was researching maps and planning canoe routes for the BWCAW trip. As for the genre, I believe most of the great dystopian books have strong Libertarian leanings. Basically, it’s the idea that not many people want to be told what to do—especially not forced to do something. I think teens can easily relate to that. Do you write any other genres and are you currently working on anything? So far, all I’ve managed to write are young adult adventure stories. It’s really what influences me. I’m thrilled to announce I have a brand new adventure book coming out around the end of January 2015. It’s not dystopian, but it’s a little dark and edgy along with a hint of romance. So I invite everyone to look for Game Changer, a ‘float trip gone wrong’ book, to be released soon. It’s set in my home state of Missouri and can be thought of as a bit like Deliverance…for teens. Also, the third book in the Northwoods Trilogy will be starting production soon. Return to Northwoods will hopefully be out in (relatively) early 2015. In lieu of the holidays, tell us some fun holiday facts about yourself. What would be your ideal Christmas presents or vacation? Fun facts, hmm… Uhm, so I have to tell you I’m really not that exciting. As an adult, Christmas is all about the kids now, which is nice, but different. For the ideal part, I’d have to go with vacation over presents. Every time I’m lucky enough to have a little time off work and travel away from home, it seems like inspiration strikes. There’s something about new places that brings adventure stories to mind. Thankfully, I’ve never had any epically bad experiences like my characters always seem to be running into. For Christmas, I’d like to go to Disneyworld. Halloween was very cool there, and I’d like to see the park lit up for Christmas. Anywhere else warm would be a close second. Do you have a favorite tradition you look forward to at this time of year? What tradition would you like to start? We put the tree up around Thanksgiving. Artificial. Tried a real one once and it was fine. The house didn’t burn down, and it wasn’t a big deal to get rid of it after the holiday. Life is extra busy around the holiday, so I remember it being a bit of a hassle to go cut one down and bring it back. And cold. So it was fun, but time consuming and chilly. I don’t think I’d buy one at a tree lot—not that there’s anything wrong with that. Christmas is all about the family, so board games, playing cards, sipping a few beverages—and generally taking off the week from Christmas to New Years. I’m pretty old-fashioned, so not one to come up with new traditions. But it’s fun to think about. Let me get through this holiday, and I’ll let you know if anything comes to mind for next year. Are you an eggnog kind of guy or an apple cider man? I can’t say that I’m a big fan of the nog, not even with a little something extra added. I’ll have to go with apple cider, though I’d really rather warm up with a nice fire and some Wild Turkey and Sprite. Thank you so much, Chris, for taking time to share your writing and yourself with all of us at BOD! Thank you for the opportunity! It’s my pleasure. You all work so hard at the group keeping it fun. And tons of giveaways. I’m really happy to have found this group so long ago. Or did you guys find me? I forget. Anyway…all I know is it’s always a joy to see the latest contests or read the insanely funny comments. Keep up the great work! Chris Bostic is an author of young adult novels from St. Louis, Missouri. 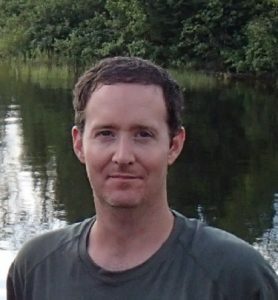 An avid outdoorsman, Chris uses his experiences to write ultra-realistic, gripping action/adventure, wilderness survival books that appeal to young and old alike. A father of three and husband to one, Chris shares his outdoors passion with his loving wife, three wonderful children, and a Boy Scout troop. Chris’ teenage son, Jonathan, is an Eagle Scout. His red-headed middle child, Helena, has a passion for reading (and is a budding young author). His youngest child, Julia, is a very smart preschooler who is growing up too fast–but keeps him young at heart. Somehow, between a full time job and a busy family, Chris finds time to write.